Product categories of Industrial Gigabit Ethernet Switch, we are specialized manufacturers from China, Industrial Gigabit Ethernet Switch, Industrial Ethernet Switch suppliers/factory, wholesale high-quality products of Gigabit Ethernet Switch R & D and manufacturing, we have the perfect after-sales service and technical support. Look forward to your cooperation! 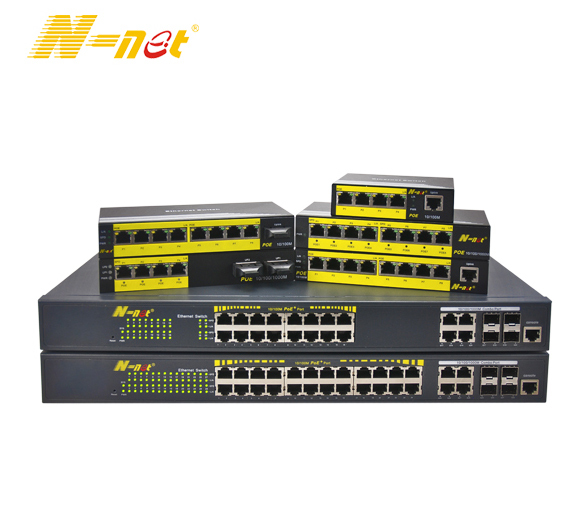 To satisfy the increasing demand of PoE for Fast Ethernet (FE) networking, N-net has developed this series of PoE FE switch. The Industrial Fast POE Media Converter, which provides 10/100BASE-TX 802.3af/ at PoE copper ports and uplink 10/100BASE-FX fiber port. The industrial fast POE Media Converter supports 60-watt PoE budget to power up to 4 IEEE 802.3af (or 2 IEEE 802.3 at) compliant powered devices simultaneously. The PoE features make an efficient and cost-effective solution for SMB, SOHO or other similar fields where there is deployment of PoE network for the wireless access points, IP-based surveillance cameras or IP phones anywhere else.